Yesterday, on Tuesday, November 6, 2018, California voters rejected Proposition 6 which would have repealed a gasoline tax increase that went into effect in November 2017 through the enactment of the Road Repair and Accountability Act, or Senate Bill 1 (SB 1), in April 2017. The proceeds from SB1 provide approximately $5 billion a year for road and transportation projects. The defeat of Prop 6 will allow the proceeds from SB 1 to continue to be allocated to various projects across the California transportation network, including the Capitol Corridor train route. Currently, the Capitol Corridor Joint Powers Authority (CCJPA) has several projects underway or in the planning phases that are financed with SB 1 funding. Taken together, these projects are designed to improve reliability, enhance safety, expand service, and reduce greenhouse gas emissions. Into the future, the CCJPA will receive a direct appropriation of approximately $5 million every year, and every two years, is eligible to compete for awards of up to $250 million. This is on top of the $93 million that has already been received by the CCJPA over the past year to implement projects such as signal replacements, safety and security improvements, and expanded service to Silicon Valley and between Sacramento and Roseville. Please know that the CCJPA is committed, as always, to being responsible stewards of all taxpayer-generated funds that are allocated to the CCJPA to improve and enhance the safe, reliable, customer-focused operation of the Capitol Corridor trains. Thank you! 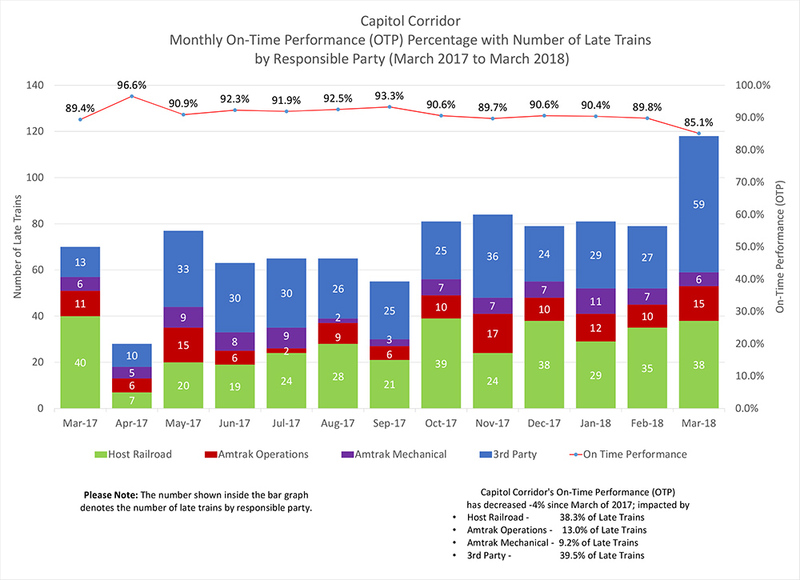 Over the past year, the Capitol Corridor Joint Powers Authority (CCJPA) has seen strong and steady growth in ridership, as well as progress made on many important safety and improvement projects. Unfortunately, this success has not always been matched by reliable service. 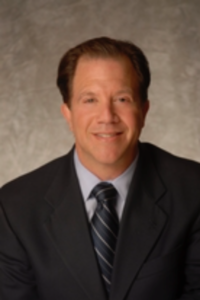 The Capitol Corridor’s service in the past year, and particularly over the past six months, has not been up to the levels you are used to and have come to expect from us. I know this is frustrating for you. It is frustrating, and unacceptable, for us as well. As passengers, you have experienced delays of considerable length – 30 or more minutes – and sometimes extending into hours. The resulting end-point On-Time Performance (OTP) has been hovering around 90%, and station OTP has dropped to levels between 80% and 90%. In past years, OTP has ranged between 92% and 95%, and our goal is to push it back up and keep it in that range. What Is Causing These Train Delays? The increase in train delays has not gone unnoticed by the CCJPA management team and Board of Directors. We have been poring over data to learn more about why delays are happening, so we can fix the problems within our control, better understand and reduce those issues that are out of our control, and ultimately get our service reliability back on track so you can count on us to get you where you need to go. Reviewing delays over the past year, we’ve identified an assortment of primary causes for late trains and outlined them below, along with strategies for resolution. Mechanical delays are caused by non-safety related train problems. Some mechanical issues are a simple function of aging equipment, while others are related to maintenance. Also, while we are ecstatic about our sleek new Charger locomotives that reduce greenhouse gas emissions, the glitches that naturally go along with any new piece of equipment have taken longer to diagnose and resolve, contributing to delays. Now that the train engineers have more experience with the Chargers, we are seeing this segment of delays going down. What we’re doing: To reduce mechanical delays, we are continually working to finetune our maintenance procedures and training of staff. Caltrans, which owns most of our trains, is also looking to acquire more Charger locomotives, so we can ultimately replace all the older locomotives with modern, eco-friendly equipment. There are two bridges along the Capitol Corridor route – the I Street Bridge in Sacramento and the Carquinez Bridge between Martinez and Suisun. While our service rarely experiences delays at the I Street Bridge, the bridge in Suisun is one of the biggest sources of late trains. Because maritime vessels have the right of way, delays here are caused when the railroad bridge is lifted to allow ships through the Carquinez Strait as a train approaches. What we’re doing: The Capitol Corridor and Amtrak are working with the Coast Guard to review all train delays caused by the bridge lift. This review will occur every 30 days to identify and reduce delays to Capitol Corridor trains. We have also provided the Bar Pilots Association, whose members are responsible for guiding vessels through the strait, with a schedule of all train meets at the bridge, so they can be aware of and avoid potential train delays as much as possible. Signal lights, which are placed at set distances along the railroad tracks and are controlled by our operating partner and track owners, Union Pacific (UP), serve much the same purpose as traffic lights on roads – they allow trains to safely follow one another to help control the flow of traffic. If there is a problem detected along a segment of the tracks, a “red signal” will be activated as a default and stop all trains within that area. The system is designed to maximize caution and safety, and trains must be stopped and/or slowed down until UP fixes the problem and releases the trains. What we’re doing: In partnership with UP, CCJPA is funding an upgrade of the track’s signal system, which will significantly improve reliability along the entire service area. The project is underway, and we expect it to be completed within three to six months. Trespasser incidents occur when individuals unlawfully walk on or near railroad tracks and are hit by an oncoming train. These are not only the most disruptive incidents, causing delays of up to two to three hours due to the involvement of local authorities, but they are heartbreaking because human lives are usually lost. It bears repeating, being on or alongside railroad tracks is not only unwise, but it is also illegal because technically that area, also called the “right of way,” is owned by UP. In less serious, yet similar circumstances, incidents along the railroad right-of-way (such as fires on adjacent properties or vehicles or debris on the tracks) may require law enforcement and railroad inspection activities that temporarily disrupt all trains in affected areas. What we’re doing: In addition to our ongoing participation in education and outreach about safety around railroad tracks, the CCJPA has recently received funding to implement specific programs, in partnership with UP, to discourage trespassing, as well as encampments. This funding allows us to install protective fencing along particularly vulnerable areas of the route and to hire a crew, which is starting in April 2018, dedicated to regularly clearing vegetation and removing trash and other debris along the tracks. In addition, we’d like to ask for your help in reporting any encampments or large piles of trash you notice along the tracks. Please note the date, the train you are on, and approximate time and location and submit via the Capitol Corridor’s online feedback form. The CCJPA will work with UP to get clean-up crews to the reported site, and by doing so, will reduce the potential for delays. We appreciate your assistance in this effort. 10% Off in May . . . In closing, please be assured that our top priority is, and will always be, to provide our riders with a safe and reliable journey within the Northern California megaregion. I understand that whether you’re traveling for work or pleasure, getting to your destination on time is of critical importance. In hopes of compensating you for our recent delays, we will be providing you and fellow passengers with a 10% discount on Capitol Corridor tickets for the month of May (one-way, round-trip, Monthly or 10-ride ticket). More details will follow about the upcoming discount. On behalf of the CCJPA team, please accept our apologies for the less-than-adequate service reliability you have been experiencing lately on the Capitol Corridor trains. Rest assured, we are taking the necessary steps to address the root causes of the current delays and implementing actions to limit and prevent their recurrence with the intent that you will continue to choose the Capitol Corridor for travel within Northern California. As you know, on Monday, December 18, a Cascades train operated by an Amtrak crew derailed on a highway overpass in DuPont, Washington, resulting in three deaths and dozens of injuries. Train 501 was making its inaugural trip between Seattle and Portland using a new section of track owned by Sound Transit in Washington State that is intended to reduce travel times for the route. We at the Capitol Corridor Joint Powers Authority (CCJPA) were shocked when we were informed of this tragedy on Monday morning, and we are saddened by the loss of life and the injuries sustained. We know that an incident like this is particularly difficult for you as Capitol Corridor train passengers. Since Monday morning, we have received questions from some of you about the derailment and concern about the safety of Capitol Corridor train operations here in Northern California. I’d like to address some of those concerns as best I can. First, please be assured that your safety, and the safety of the Amtrak operations team, is and will continue to be our Number 1 priority. As a Capitol Corridor passenger, each time you board a Capitol Corridor train, you trust that Amtrak, the CCJPA’s operating partner, will get you to your destination safely and without incident. This commitment to safety has never wavered. With respect to Monday’s derailment, let me start by saying that the accident remains under investigation, and I am not able to confirm or draw any conclusions about its cause. However, each incident that occurs in the railroad industry gives us an opportunity to determine what lessons can be learned and what improvements can be implemented to enhance and strengthen the safety and security of Capitol Corridor passengers and employees. Over the past year, we have worked closely with Amtrak to improve communications between the conductors and engineers when the train is approaching areas of the route with permanent or temporary speed restrictions. Amtrak’s management team provides safety oversight through employee field testing and observation as required by the Federal Railroad Administration (FRA). We are confident the Amtrak and CCJPA partnership will continue to ensure the safety of Capitol Corridor passengers and employees, as well as the general public. One of the other concerns that has been raised by some passengers and the media in the wake of this recent derailment is Positive Train Control (PTC). You’ve probably read that PTC is a technology designed to slow down trains that are going too fast prior to exceeding the speed limit, and that PTC had not been activated on Train 501 that derailed on Monday. Many of you are wondering if the Capitol Corridor service has PTC and if that technology is currently activated on our route. PTC is a very advanced, data-driven, communication-based technology. While the hardware equipment is being or has already been successfully installed on all required rail vehicles and locomotives, there is still some software installation and programming that remains. After that, the system will need to be tested. We expect Amtrak and the host railroad to start testing select Capitol Corridor trains in mid-2018, with full implementation by the December 2018 deadline established by Congress. Our thoughts and prayers go out to those who were injured and to the families of those who died in the DuPont derailment on Monday. This was a tragic incident, and you have my assurance that the Amtrak operating team and the CCJPA are committed to ensuring your travel on the Capitol Corridor trains is a safe and pleasant experience. As much as we like to promote the amenities of our trains – the wi-fi, the Café Car, the spacious seating, etc. – at the end of the day, our main goal is to get you where you need to go safely. Thank you for riding the Capitol Corridor. I wish you a very pleasant holiday and look forward to welcoming you aboard the trains in 2018.